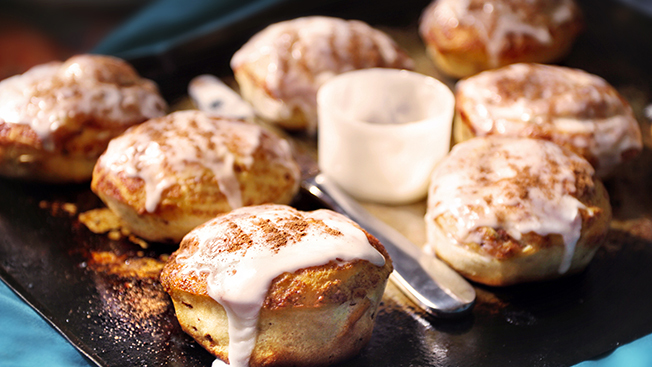 In Cinnabon's latest brand extension, the global baked goods chain will launch a standalone store called Bon Bake Shop. Set to open in mid-September at Willowbrook Mall in Houston, the spinoff will offer a decidedly different image and inventory from its parent company. As reported by Bloomberg Businessweek, this launch comes on the heels of several other extensions, including Cinnabon's partnerships with Beam's Pinnacle Vodka, Cream of Wheat cereal and Taco Bell desserts. Cinnabon president Kat Cole, who joined the company nearly four years ago as COO, has been aggressively moving the chain into new product areas. Businessweek noted the new artisanal extension allows Cinnabon to experiment without putting off fans of its 1,200 stores. The Bon Bake Shop will feature bite-sized pastries with a choice of nine frostings, including Smores, Maple Bacon and Wild Berries & Cream. In addition to basic flavors such as Cream Cheese and Caramel Pecan, the store will offer foodies rotating seasonal choices, such as Pumpkin Caramel, Toasted Coconut, Bavarian Cream Pie, Brownie Batter and Butterfinger. The miniature cakes will be sold in multi-packs, ranging from a four-pack for $3.69 to a 16-pack for $13.99. The tiny treats are about 90 calories versus the original's 880, inviting a health-conscious customer. In addition to mini-cakes, The Bon Bake Shop will also offer cheese rolls, twists and Whoopie Pies. The menu and name aren’t the only differences: The new store will have a more refined, subtle look and feel. The decor will feature warm, neutral colors, and the staff uniforms will reflect a softer image. During the preliminary testing phase, the company will only open three Bon Bake Shops this year.